Being a craft beer lover, I often buy bombers. The problem with bombers is that I try to limit myself to 1 beer a night. You can’t do that with a bomber, once you open it, it starts going flat. That is where the Hermetus bottle opener and resealer comes into play. First off it’s a great, strong, and sturdy bottle opener. The bottle opening features would be slightly improved with a magnet to stick to the side of the fridge. But there are billions of bottle openers and few resealers, which is where this product shines. As you can see in the above pic, the opener narrows down on one end with tracks on the side that fit the standard bottle opening. This track has a piece of rubber on the bottom of it. After pouring your first pint, you slide the bottle into the track, and the rubber creates a seal around the top of the bottle. You may be wondering just how tight is the seal formed? How about tight enough to flip a half full bomber upside down and not lose any beer tight! Well, that’s great and all but how does the beer taste after using this thing? My plan was to open the bottle on Monday, reseal it, and finish it off on Wednesday. Well, life got in the way and I didn’t get a chance to reopen this bottle until Saturday. If left open for five days you can guarantee this beer would’ve been flat and poured down the drain without ever touching a glass. 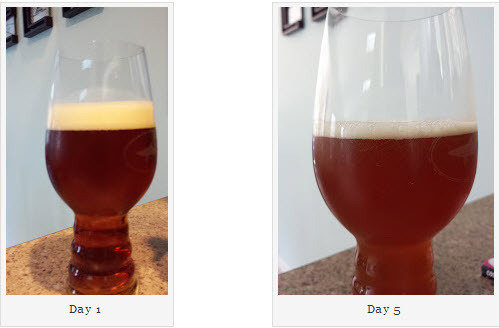 However, as you can see below, there was enough carbonation left in the beer to produce some head! The Hermetus is giving my previous favorite bottle opener, the Millennium Falcon a run for its money! 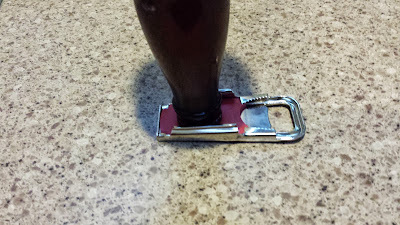 The Hermetus opener/resealer is giving this a kessel run for favorite bottle opener! If all this has inspired you to buy one then head to Amazon.com which currently has them on sale for just $7.65! Yep, I’ve had a few that it didn’t quite fit right. Plus one corked bottle that it sadly didn’t come close to. And props on the madly fast comment! You must’ve replied within a minute of me posting. I definitely need to try this out. I had been actually planning to do a post on resealers myself. Glad to see it worked well for you. I would imagine at only 1 or 2 days it works even better.